We are pleased to announce that the new G&G Gen.3 AEGs are compatible with 11.1v LiPo Batteries! 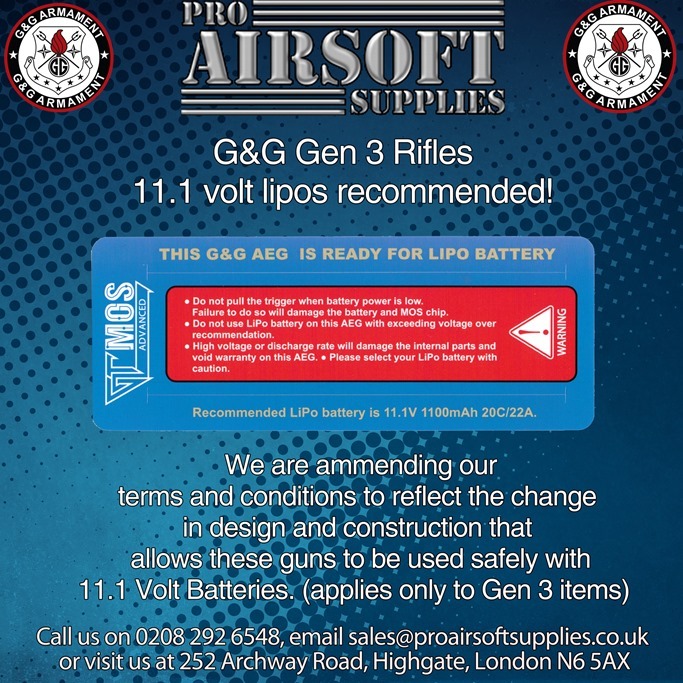 In one fell swoop, G&G have solved the issues with the previous Gen.2 Rifles that made them incompatible with 11.1v batteries resulting in an AEG that can be enjoyed with the best possible trigger response and rate of fire safely! The previous Gen.2 and normal AEGs work by connecting blocks of metal together to complete the circuit, and with high voltage batteries, sparks jump between them every time you pull the trigger which is called “Arcing”. This arcing wastes battery power, causes heating of the wire and motor and erosion of the trigger contacts, and eventually causes them to fail! The MOSFET unit that G&G have installed in the Gen.3 Rifles eliminates all Arcing by replacing the power-switching to a piece of high-grade Silicon Semi-conductor, which cannot arc or wear away, as well as allowing power to flow faster and more efficiently compared to a traditional switch! Additionally, the Gen.2 Rifles could not be used with 11.1v batteries because they would develop a problem known as “over-cycling”, where the rifles would fire twice or more in semi-auto due to the efficient system, but the new MOSFET that G&G have installed features Active Braking, which brings the motor to an immediate stop as soon as the trigger is released or the cycle has finished in Semi-Auto. This means the gun will never fire more than one shot in Semi-Auto, and your spring will always be in the most relaxed position possible after firing in Semi, which will maintain your gearboxes life as long as possible!